Nice work! Reworking a finished garment can seem like a pain but it's worth it if you get something you'll wear more at the end. I just painstakingly unpicked a lined (and understitched) bodice because the shoulder and sleeve weren't fitting right - whipped off the sleeves and tightened up the shoulder seams and now I love it! That looks much more wearable as pretty as the bow was getting it trapped in draws is the least of the trouble something like that would cause me. 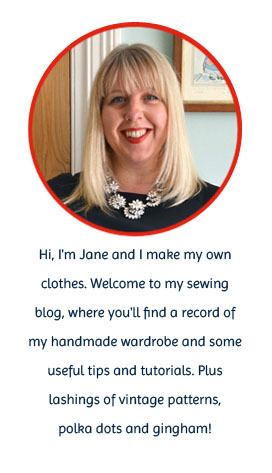 I have a handmade dress thats fit is all wrong that I have to adjust, it's the first post on my new blog, I think I am going to cut the bodice off and and make it into a skirt but not sure how yet. Ahha, what a great idea! 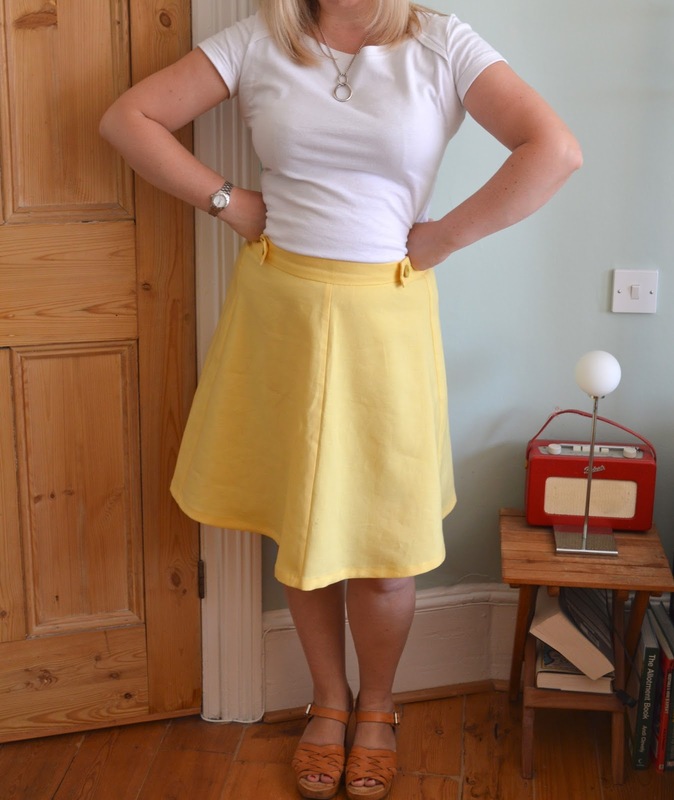 I don't wear my Miette as much as I might because of the tie so had decided I'd use button tabs instead if I made another one, but hadn't thought about adapting my already made one, makes total sense! Thanks for the info on how you did this. I have quite a pile of things which need to be repaired or altered, but I never seem to get on with them! I like the change. I wouldn't want a big bow either. I have yet to attempt a refashion/alteration other than cutting down long pyjamers to short ones. This is a really effective refashion! It definitely looks more wearable now. I love how bright and sunny it is! It's a completely different skirt. I really love it, especially with the button tabs instead of the bow. 1. Went back in twice (twice!!) to make a straight-shoulder adjustment to a slip-on top. First fix took care of the Mouth of Hell openings at each side of my neck. Second fix necessary to smooth out the weird mid-shoulder bubble that resulted from the first fix. I WILL make the blouse again, but noted on envelope to take out at least 1/2" near the neck. 2. Took a set of ties off the back of a blouse, as I am too old for a twee bow on my back, just above my giant middle-aged bum. I will wear the blouse more often now. I might need to borrow this idea to adjust some ties on an Afternoon blouse. I can't reach round my back to tie them tidily, so they are a bit of a nuisance. I have plenty of buttons to complete the effect. I just need to make sure that I can still get it over my head when I make the adjustment though!! I love this fix! I'm not a fan of big bows either, I'm just too small for them. Here's hoping we get some more nice weather, so you can wear it some more. I think this looks great! Well done! I've only just started making clothes but posts like this give me lots of inspiration for altering things. Thank you! Brilliant fix! What a great post - I think you may be inspiring a few re-makes around the interwebs now. Such a pity if almost-awesome handmades go to waste. Lovely alteration! I can see that it is much more practical. 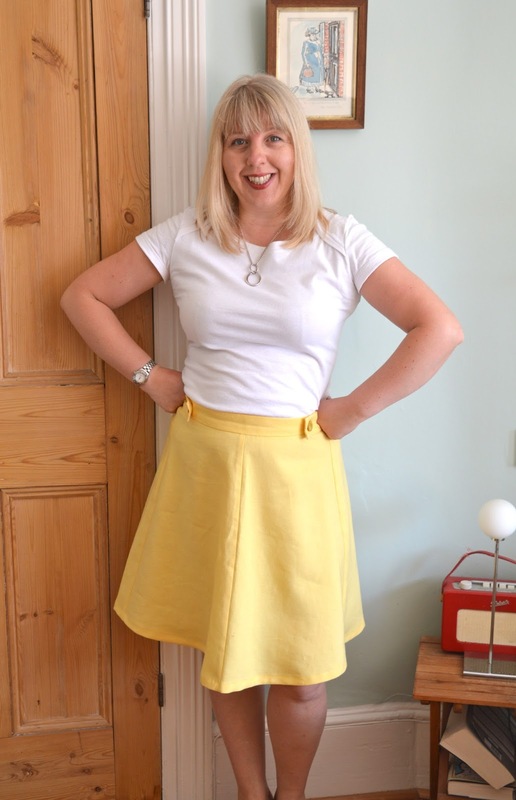 I just blogged about a dress that I altered to fit due to weight loss and I chopped 4 inches off the hem! It's much less frumpy now. 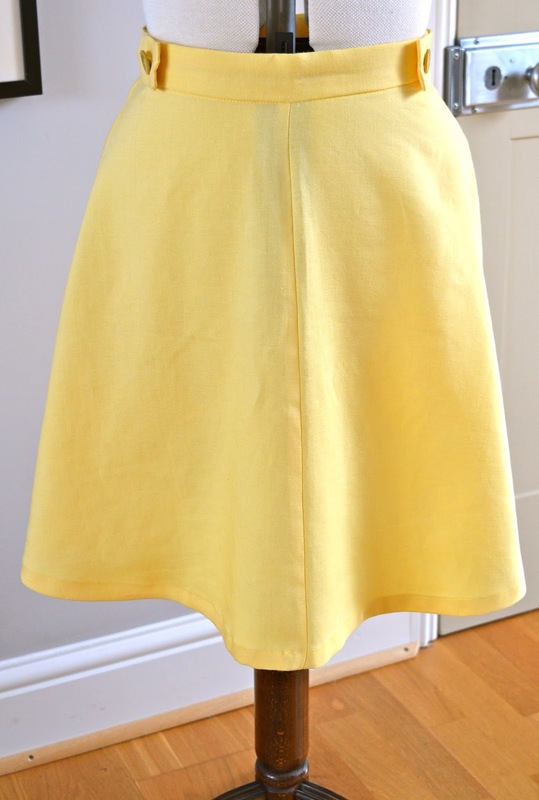 Great refashion! 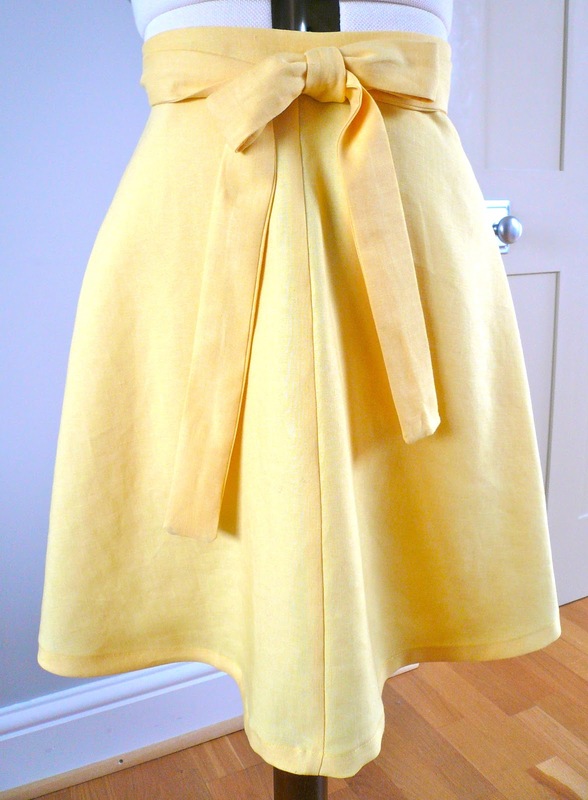 I really disliked the bow on my Miette at first, and ended up tying it behind the skirt in a knot. I've got used to it now and don't even think about it. 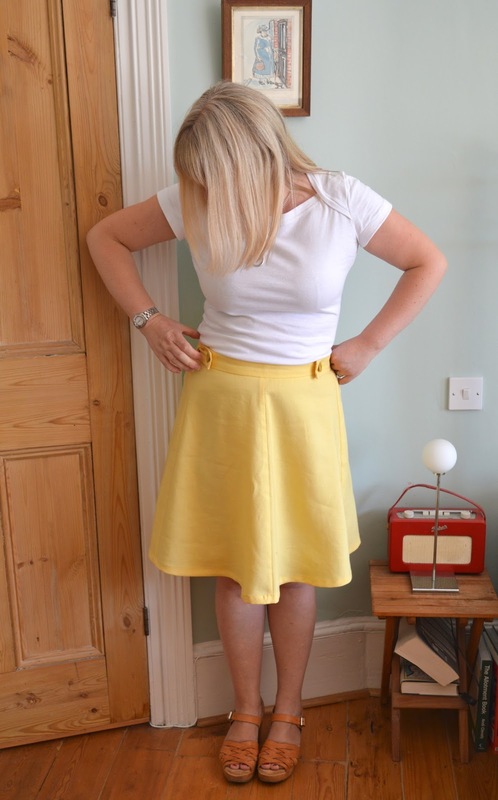 Sadly the skirt is in need of some repairs right now - it gets a lot of wear.